GRP (fibreglass) towers are light-weight scaffold towers for use in Zone 1 applications where aluminium or steel systems are either unsafe or unsuitable. The worlds premier Glass Reinforced Polymer – GRP (Fibreglass) access tower system They provide indoor and outdoor access where a non conductive platform is required. Ideal for maintenance, installation work and short-term access. Also for High voltage areas, sensitive areas such as data centres. When you need specialist equipment specifically designed to help you work in sensitive areas then a Grp fibreglass scaffold tower hire is an absolute must. This specially designed lightweight fibreglass scaffold tower is ideal for maintenance, installation work and short-term access in zone 1 areas. Because it is made of fibreglass it means that the Grp scaffold tower can be used in sensitive high voltage areas such as data rooms and telephone exchanges where it would be far too dangerous to use aluminium and steel scaffold towers. 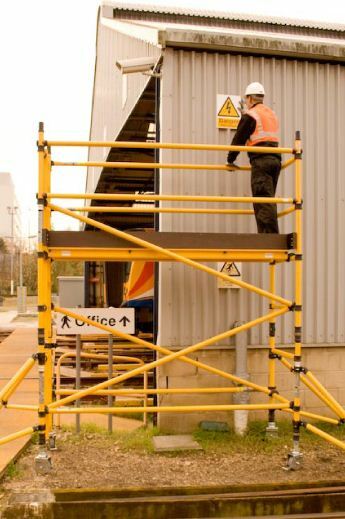 The Grp scaffolding tower is made from non-conductive materials and it has an internal ladder which makes it ideal for use in zone 1 areas especially when experts need to carry out electrical work safely. A zone 1 environment indicates that there is risk of an explosive atmosphere on a day-to-day basis including oil refineries, power stations and the gas industry. It can also denote areas within the industrial sphere that could hold a greater risk from fire, electrical or chemical hazard. A Grp scaffold tower hire provides both indoor and outdoor access for those times when a standard aluminium or steel scaffold tower is simply unsafe or not suitable and it is highly recommended to professionals working in zone 1 environments. There are so many advantages of using this type of equipment and Grp access tower hire is easy to do. The structure is non-conductive, non-corrosive and cleaner to handle because there is no oxidisation. The Grp scaffold tower is also safer from spark risks, it is high visibility and has low residual value which means a lower theft risk. If you are considering Grp tower hire give experts at Lakeside-hire a call. Grp scaffold tower is quick and easy to do and it is affordable – ideal for both one-off jobs and longer term projects. Call Lakeside-hire today for next-day delivery guaranteed.